HMS Repulse, a 26,500-ton Renown class battlecruiser, was built at Clydebank, Scotland. Completed in August 1916, she joined the Grand Fleet following post-trials modifications and operated in the North Sea for the remainder of World War I. The light protection of this class of two battlecruisers was a considerable cause for concern and, soon after the Armistice, Repulse received an extensive refit. This significantly increased her armor, and her displacement, which rose some six-thousand tons. The work was completed in 1922, after which the ship began a peacetime career of fleet operations and long-distance cruises. In 1933-36, Repulse was again modernized, emerging with improved deck armor, a hangar and catapult for aircraft, and a greatly increased anti-aircraft gun battery. She operated with the Home Fleet in the North Sea and Atlantic during the first two years of the Second World War, taking part in the pursuit of the German battleship Bismarck in May 1941. Later in the year she was sent to the Far East, accompanying the new battleship Prince of Wales. The two ships arrived at Singapore just before Japan began the Pacific War. As soon as hostilities commenced, both steamed northwards to intercept a reported invasion force. While returning to Singapore on 10 December 1941, Repulse and Prince of Wales were attacked by Japanese high-level bombers and torpedo planes. Repulse was moderately damaged by bombs early in the action and was later hit by several torpedoes. After receiving this heavy underwater damage, she sank rapidly, followed less than an hour later by the Prince of Wales. 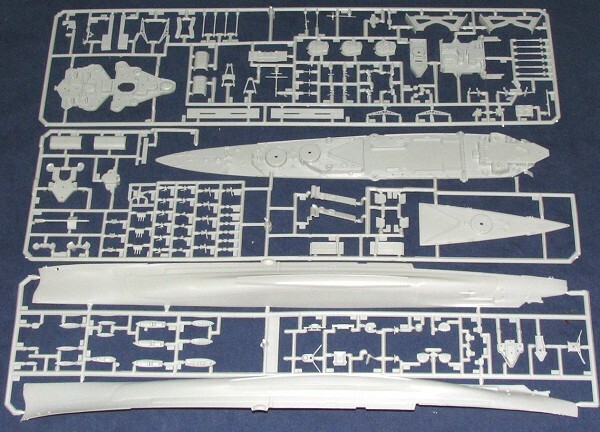 The other ship kit offered by Frog is the HMS Repulse. Again, since they were both sunk in action near Singapore, it is quite logical that this kit be offered. Molded in a light grey plastic, the condition of the molds is excellent with no appreciable flash. There are the usual ejector pin marks and for sink areas, I did find a few of them on some of the upper deck pieces. I also found very prominent ones on the forward part of the turrets. However, since they are all identical in shape, it may well be that this is the way the forward section of the turret was designed. If not, you have quite a filling job to do. These Airfix kits were all full hull designs and as such come with stands, prop shafts, rudders and so on. One could cut the hulls to make waterline versions, but I'm thinking this would weaken the hull and cause some distortion without putting in braces prior to hacking away. All the main turrets are designed to rotate and the guns elevate. Drilling out the barrels will further enhance the look of things. The usual myriad of smaller weapons, ships boats, searchlights, cranes and so on are provided. Even a nice Walrus for the ship's aircraft is included, though insignia will have to be hand painted on this one. No ship's rigging diagram is given, so one will need to resort to the box art for that information. The instructions are basically a copy of the Airfix version. It is easy to follow and paint information is provided with Humbrol and generic information. This version of the HMS Repulse is camouflaged in a most interesting scheme that should make for a most interesting looking ship when done. It is great to see these older ships being reissued. The Repulse is one that doesn't see the light of day too often at shows, and perhaps this will now change. For those wanting a bit more detail, I'm sure there are photo etch sets for it that will really make it come alive. For those wanting to do it right from the box, you'll still have a very nice display model for your collection. Many thanks to Frog Models for the review sample. Visit them at www.hobbybounties.com for more information.